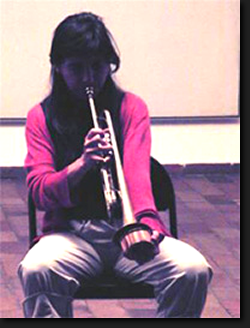 Since her integration in IBA, col.lectiu de música i dansa improvisades, in1999, she starts to focus her work in free improvisation. Her trumpet explorations try to redefine the role of her instrument in a similar way as the work of Masafumi Ezaki, Frantz Hautzinger, Axel Dörner, Matt Davis to name just a few of them. Currently, she has two stable formations : error focus with Ferran Fages and i treni inerti with Alfredo Costa Monteiro. She has participated in festivals such as: REVERS 2001 (CCCB – Barcelona), HURTA CORDEL 2001 (Madrid) and FRUITS DE MHERE 2002 (France) with i treni inerti, NITS DE MÚSICA 2000 and 2002 (Fundació Miró – Barcelona) with l’Orquestra IBA and Peter Kowald and with i treni inerti, FESTIVAL DE MÚSIQUES CONTEMPORÀNEES 2000 (Auditori – Barcelona) with l’Orquestra IBA and Butch Morris and SONIC SCOPE 2002 (Lisboa) with Margarida García, OFF-SITE (Tokyo) with Masafumi Ezaki.